Creation? These Fossils Say "No!" This was practically my first serious contribution to defending conventional science against creationist attacks. I wrote it in January 1995, shortly after I had first gotten involved in creation-evolution discussions in Compuserve's Dinosaurs Forum. I updated and revised it a little in fall 2013 with help from geology professor James St. John, of The Ohio State University at Newark. Strictly speaking, this article isn't about evolution at all. It's about geologic time. It discusses an extremely simple and obvious hole in the young-earth creationist claim that the fossil record is the result of the Biblical Flood. No creationist has ever successfully criticized this piece. None has ever even had the courage to try. If you take a map of Ohio, Kentucky, and Indiana, and draw a circle of fifty kilometers radius centered on downtown Cincinnati, the area inside the circle contains some of the finest Ordovician Period fossil beds in the entire world. In fact, a part of the Upper Ordovician has been designated the Cincinnatian epoch, because its fossils are better exposed here than anywhere else on Earth. 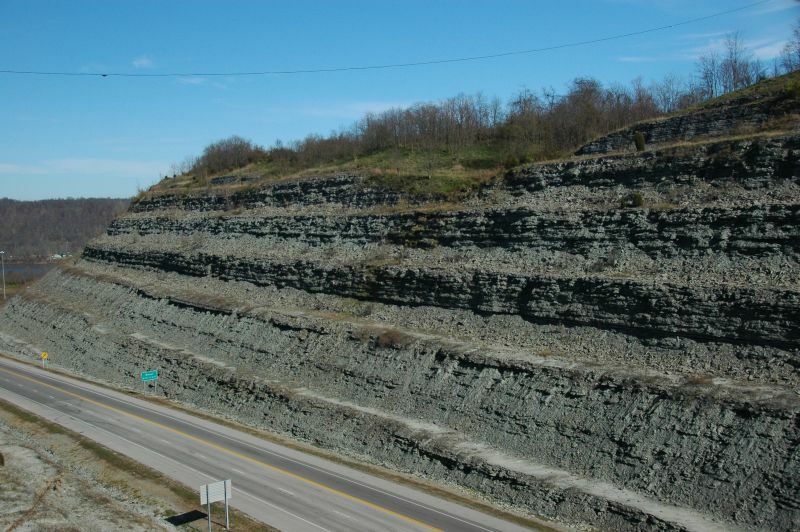 Based on lithology, the sedimentary rocks of the immediate Cincinnati area are divided into three formations. (Many more formations and members can be distinguished if you also use fossils for correlation.) The lowermost one is the KOPE Formation. It consists mainly of shale with layers of limestone scattered irregularly throughout it. The Kope's typical outcrop pattern is 1-2 meters of shale layers, then a layer of limestone, then another 1-2m of shale. The individual shale layers are thin, breaking into flat fragments perhaps 5-10 millimeters thick. It's typical shale: blue-gray, flimsy, easily broken and worked out even with the hands. The individual limestone layers are thicker and sturdier, around 5-6cm and difficult to break with a geologist's hammer. An excellent exposure of the Kope Formation can be found on the east side of Cincinnati, where Interstate 275 crosses the Ohio River. Just west of this, on the right side going south, is a cliff that exposes at least 25 meters of Kope Formation rocks. Above the Kope Formation lies the FAIRVIEW Formation. This formation also consists of limestone and shale, both similar in quality to the Kope Formation rocks. The major difference lies in the layering. In the Fairview Formation, the limestones and shales are more evenly distributed: a meter or two of shale layers, then a meter or two of limestone,then more shale. A given limestone bed may consist of several distinct layers of limestone. Above the Fairview is the third major formation, the BELLEVUE. Again, it's primarily interbedded shale and limestone, substantially similar to the Fairview. However, in the Bellevue Formation, there is much more limestone and much less shale than in the Fairview. This roadcut in Marysville, Kentucky, just south of the Ohio River, exposes a beautiful vertical cross-section of Cincinnatian rocks. The lower half of this roadcut is Kope Formation, with its characteristic thick shale beds and thin limestones. The rocks above are the Fairview Formation, with much thicker limestone beds and much less shale. No other kind of rock appears in any of the three formations, only this one type of shale and one type of limestone. There is no siltstone, no graywacke, no conglomerates, no sandstone, no flysch. Just shale and limestone. The shale layers show none of the graded beds typical of turbidity current deposits or of lithified turbidites, nor do they display the sequence of sediments characteristic of a turbidite. The layering is regular and obvious, and consistent no matter where in the Cincinnati area you look. Avey's Run, a creek in north-central Clermont County, cuts through rock that is easily recognizable as the Kope Formation. Further north and a few meters higher, O'Bannon Creek cuts Fairview Formation rocks. With a few minutes of study, any amateur rockhound can easily identify the rocks at almost any roadcut in southern Ohio or northern Kentucky. Most Cincinnatian rock exposures are dripping with fossils. They're so numerous that they practically jump out of the rock at you. 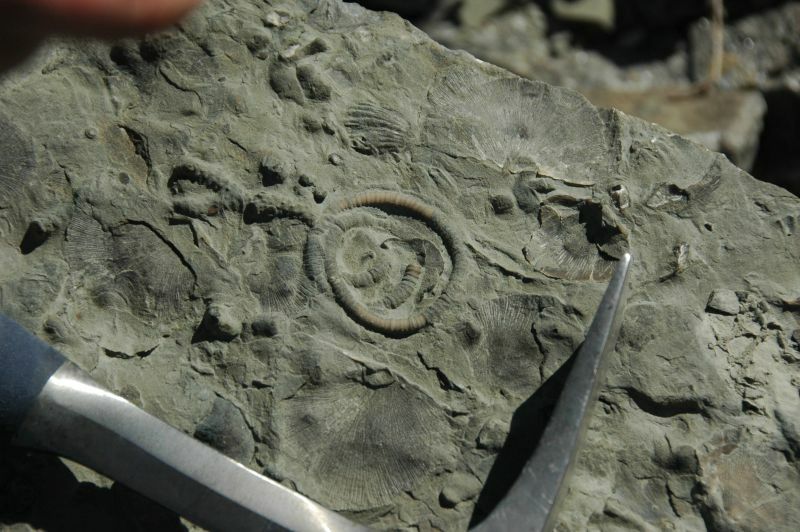 Among the species known from these beds are many types of trilobites, several species of straight nautiloid cephalopod, various sorts of bryozoans, horn corals, gastropods, pelecypods, both articulate and inarticulate brachiopods, and crinoids. The vast majority of trilobite fossils are fragments: thoracic segments from the carapace, loose cheek pieces, and so on. Whole or even partial trilobite bodies are extremely rare. Most crinoid fossils consist of stem fragments, from single segments to long stalk pieces as much as fifty centimeters long. Conodonts and graptolites are rare but not unknown. There are no vertebrate or chordate fossils. Some sites produce scraps of curved nautiloids, but there are no ammonoids. A typical block of Cincinnatian limestone, with a surface that is almost as much fossils as rock. In the center is a coiled crinoid stem. Just to the left is a piece of bryozoan. Impressions left by brachiopod shells are visible all over the rock surface. 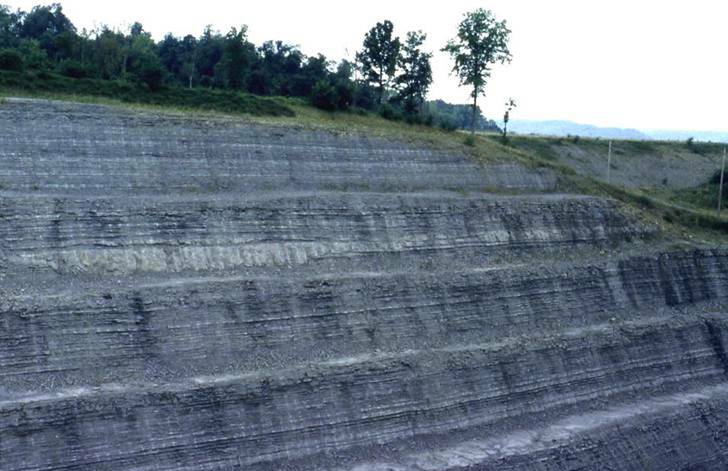 The fossil species are consistent from outcrop to outcrop within the area, from Northern Kentucky to central Clermont County to northwestern Hamilton County. The fauna doesn't change in basic characteristics between the bottom of the Kope Formation and the top of the Fairview, a span of some sixty meters and hundreds of layers of rock. Individual species come and go, but the overall fauna remains the same, made up mainly of bryozoa, crinoids, and brachiopods, with trilobites, horn corals, snails, clams, and straight nautiloid cephalopods less common but still present. There are no vertebrates, no ammonoids, no hexacorals. Chelicerates are extremely rare, and there are no crustaceans known in these rocks. Trace fossils are uncommon; however, you can find some nice ones if you know where to look. What does all this tell us? There are a number of simple observations and deductions we can make, starting with the nature of the animals preserved. To start with, we can observe that in every case, if an animal preserved here has modern-day relatives (and most of them do), then those relatives are creatures of shallow sea floors. From this we can conclude that this was very probably a marine environment when these rocks were deposited, a shallow sea or arm of the sea. Observation: The animals from the Fairview Formation are just as much marine animals as the animals from the bottom of the Kope Formation. The shale from the Fairview is the same very fine-grained shale that the Kope contains. Deduction: Conditions did not change substantially over the entire period of deposition. It was a shallow sea when the first rocks were deposited; it was a shallow sea when the last rocks were deposited; and it was a shallow sea at all times in between. What else can we observe and learn? Observation: The fossils are pretty evenly distributed throughout both formations. They're no more plentiful in the Kope than in the Fairview. Conclusion: Whatever left these fossils was an ongoing process over the entire deposition period. It didn't come and go in spurts. It was constant. Observation: The abundant trilobite fragments are clearly pieces of trilobite exoskeleton, pieces of chitin with nothing inside and nothing attached. Trilobites molted as crabs and lobsters do, and these fragments are pieces of molted exoskeletons. What we're seeing here are cases where most of the shed exoskeleton was lost, decayed, or eaten by other organisms, but random fragments were buried and eventually fossilized. Conclusion: This was not a fauna frozen in time at one cataclysmic instant. Lagerstatten like the Burgess Shale preserve many whole organisms and few fragments, and no trace fossils. These were living, moving, growing creatures, and the rocks preserve a record of that activity. Observation: Fossils in the shale of the Kope and Fairview are uncommon. By far the richer layers are the limestone. In shale, we find a few brachiopods, many crinoid bits and pieces, the occasional trilobite bit, but few if any horn corals or cephalopods or bryozoans. Those are almost all in the limestone. In the lower Kope, it's easy to find a piece of limestone chock-full of lacy-cheeked trilobite bits, brachiopods, bryozoans. Diplocraterion burrows appear only in limestone. Conclusion: The shale represents periods when deposition was slow, and few items were buried before being scavenged. The limestone represents periods when deposition took place through a different process, when animals were killed in large numbers all at once, and many were preserved completely. Then when the animals returned and the fauna regenerated, the limestone layer became the new seafloor. Is all of this consistent with the creationist, flood-geologist claims? The Flood scenario requires that all these beds be deposited rapidly, within a few years at most. Is there a way for fifty meters of sediment to be deposited that rapidly over an area of more than ten thousand square kilometers? Turbidity currents wouldn't do it; they produce thinly layered beds of sorted sediments that show easily recognizable grading, not meters-thick deposits with no perceptible grading. They also don't deposit limestone. Floodwaters wouldn't do it; floodwaters are always in motion, and the sort of fine clay sediment that makes up shale settles out only in very calm water. The Flood scenario requires that all the animals preserved be killed swiftly and buried swiftly, within a few days. Multiple layers of fossils are apparently explained by multiple waves of flooding, with intervals in between for animals to return and re-establish themselves. Modern observations show that it takes years for a ravaged marine ecosystem to re-establish itself even once, let alone five or ten times. For that matter, can the Flood scenario even explain these rocks at all? We have here rocks and fossils consistent with a shallow marine environment, in a place that is now several hundred feet above sea level and a thousand kilometers from the nearest such environment. Was this area a sea before the Flood? If it wasn't, it must have become a sea with the rising of the waters. In either case, the same question comes to mind: why did *only* these animals populate this region? Why no fish, or hexacorals, or ammonites? Fish fossils are found 200km to the east, but not here. Why not? Can the Flood scenario answer these questions? I can only see one possible answer: either by accident or by design, the fauna of this area didn't contain any of those creatures. In either case, the same two questions arise: Why was this fauna limited in such a way? And why didn't rushing floodwaters carry such organisms here from elsewhere? If this was sea before the Flood, there should be no fossils of large land animals in the area. If the Flood killed off the large land animals, we might expect to find terrestrial-type fossils below the marine rocks, but not above them. But we find Recent deposits containing mastodon and horse bones atop the Ordovician bedrock. Mastodons were supposedly wiped out by the Flood. Strange. Now let's look at the orthodox theory. Orthodox geology (including orthodox paleontology) holds that clay and shale sediments accumulate in still water a distance offshore, a few miles or so. In such regions, deposition is extremely slow, amounting to less than a millimeter of sediment a century. Such slow deposition would not bury and preserve many things, producing a shale relatively low in fossils. Orthodox geology holds that fossiliferous limestone is a result of an environment full of organisms with calcareous shells -- a shallow environment swarming with life. Such a rock should hold many, many fossils, reflecting the greater density of life. Viewed this way, these rocks become a record of many millions of years, during which life waxed and waned, sparse in some periods, dense in others, depending on the environment. Some recent work interprets the limestone layers of the Cincinnatian as storm deposits (called tempestites by geologists) -- not little storms, mind you, but GIGANTIC storms, something like modern Category 4 or 5 hurricanes. Each storm would churn up the seafloor across many square miles, rip up all the bottom life and dump it back down in a huge jumble. Each time this happened, the resulting jumble of sediment and dead organisms was mineralized into a limestone bed. Then the sea bottom re-formed on top, a process which took many years, and went back to the slow deposition of mud and fine sediment which would eventually become shale. A typical Cincinnatian seismite. Mouse over this image to see a version with the various parts labeled. Note that the seismite is completely surrounded by normal Fairview rocks. Whatever caused this seismite, it was a sudden, localized event in the middle of a long period of unchanging environmental conditions. Furthermore, some locales in the Cincinnatian preserve unusual sedimentary beds known as seismites (see photo at right). Geologists interpret these odd little formations as evidence of ancient earthquakes. Seismites are scattered throughout the Cincinnatian rocks, but not in any consistent way. Whatever process created them it was not widespread or common. The seismites are another indication that these rock layers took a long time to form -- because enough time passed that earthquakes like these could happen, not just once or twice but many times. Orthodox paleontology says that fish were a new and rare type of creature in the Ordovician. Trilobites and crinoids were still common. Brachiopods and bryozoans had not yet been replaced wholesale by clams and corals. Curved nautiloids and ammonites had not yet evolved. This matches the observations and deductions I made earlier. This should not be a surprise to anyone -- after all, orthodox paleontology is based on those observations and deductions. Conventional paleontologists set out to find a theory that would explain the facts, rather than trying to force the facts to fit a predefined theory. What final conclusion follows from all of this? I believe it's a very simple one: So-called Flood geology does not and cannot explain these rock formations, but orthodox geological and paleontological theory can and does. The creationist concept fails the simplest test of all: it can't explain observed facts. It is a flawed, failed hypothesis and always will be. CINCINNATI FOSSILS: An Elementary Guide to the Ordovician Rocks and Fossils of the Cincinnati Area. This is a short guide to the geology of the Cincinnati tristate area, including a diagram of the local geologic column and photographic plates of most of the common fossils found in Cincinnati rocks. This is a somewhat longer guide to the rocks and fossils of the whole state of Ohio. It includes simple fossil-identification keys and information on geology of the state. A huge, extremely detailed guidebook to the rocks and fossils that can be found in Ohio, including local geologic columns, photographic plates, descriptions, and much more. Unfortunately, as far as I know all of these items are only available locally, and not through regular retailers like Border's or Amazon.com. Wolf photo in header from a public-domain US Park Service photo. All photos courtesy of Professor James St. John, The Ohio State University at Newark. All corporate logos and symbols are property of their respective owners, used under terms specified by their owners. All other content on this site is copyright Jonathon Woolf, unless otherwise noted. Please see my Site Policies page for more information on copyright and other site details.